Something really amazing happened in Downtown Spokane this week and I had to share the story with you. Some of you may know that my brother, Joel, is a loan officer at Sterling Bank. 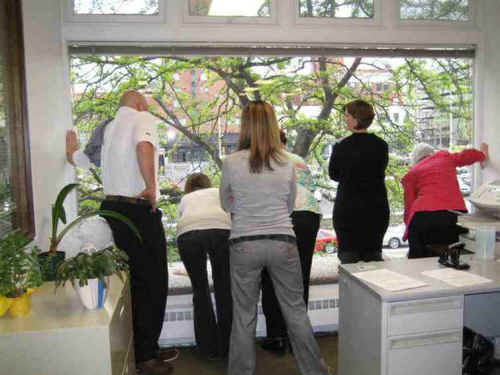 He works downtown in a second story office building, overlooking busy Riverside Avenue. Several weeks ago he watched a mother duck choose the cement awning outside his window as the uncanny place to build a nest above the sidewalk. 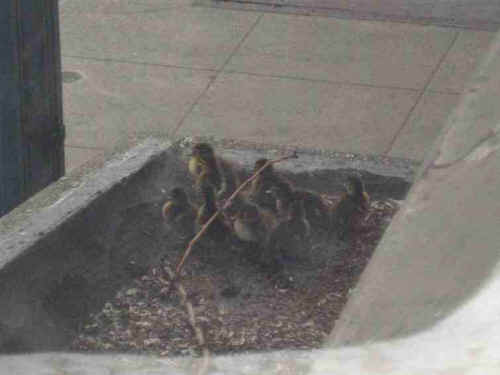 The mallard laid ten eggs in a nest in the corner of the planter that is perched over 10 feet in the air. She dutifully kept the eggs warm for weeks and Monday afternoon all of her ten ducklings hatched. 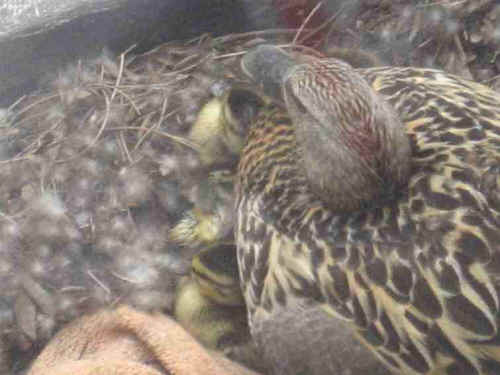 Joel worried all night how the mamma duck was going to get those babies safely off their perch in a busy, downtown, urban environment to take to water, which typically happens in the first 48 hours of a duck hatching. Tuesday morning, Joel came to work and watched the mother duck encourage her babies to the edge of the perch with the intent to show them how to jump off! The mother flew down below and started quacking to her babies above. In his disbelief Joel watched as the first fuzzy newborn toddled to the edge and astonishingly leapt into thin air, crashing onto the cement below. Joel looked up. The second duckling was getting ready to jump! 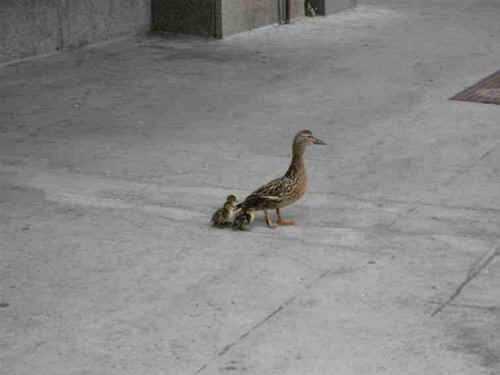 He quickly dodged under the awning while the mother duck quacked at him and the babies above. As the second one took the plunge, Joel jumped forward and caught it with his bare hands before it hit the cement. Safe and sound, he set it by the mamma and the other stunned sibling, still recovering from its painful leap. One by one the babies continued to jump to join their anxious family below. 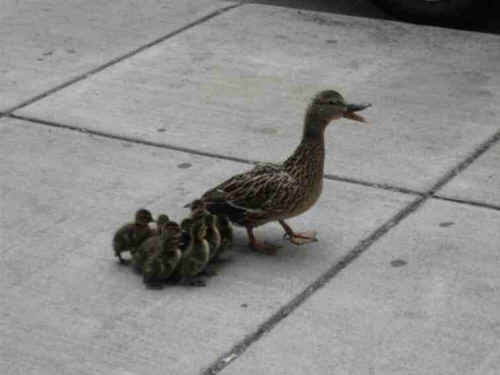 Each time Joel hid under the awning just to reach out in the nick of time as the duckling made its free fall. The downtown sidewalk came to a standstill. Time after time, Joel was able to catch the remaining 8 and set them by their approving mother. 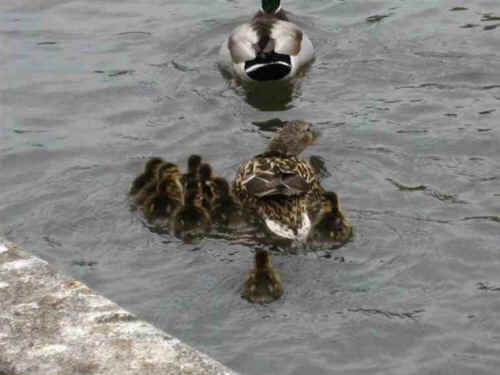 At this point Joel realized the duck family had only made part of its dangerous journey. They had 2 full blocks to walk across traffic, crosswalks, curbs, and pedestrians to get to the closest open water, the Spokane River. 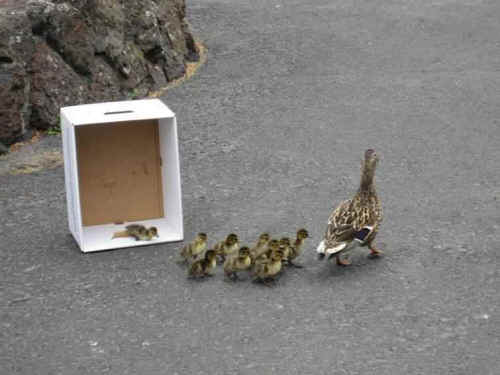 The onlooking office secretaries then joined in, and hurriedly brought an empty copy paper box to collect the babies. They carefully corralled them, with the mother's approval, and loaded them up into the white cardboard container. Joel held the box low enough for the mom to see her brood. 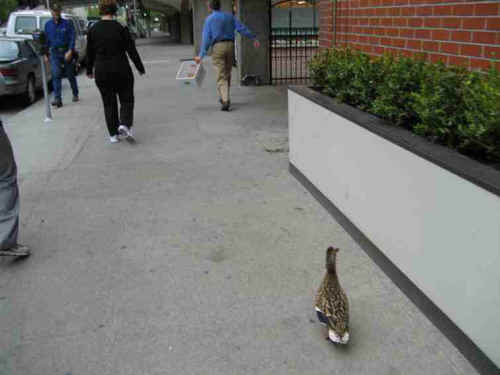 He then slowly navigated through the downtown streets toward the Spokane River, as the mother waddled behind and kept her babies in sight. As they reached the river, the mother took over and passed him, jumping into the river and quacking loudly. At the water's edge, the Sterling Bank office staff then tipped the box and helped shepherd the babies toward the water and to their mother after their adventurous ride. 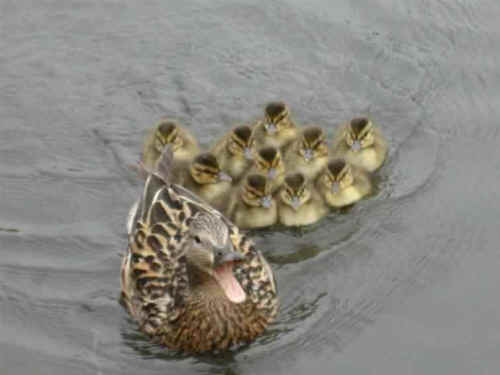 All ten darling ducklings safely made it into the water and paddled up snugly to mamma duck. Joel said the mom swam in circles, looking back toward the beaming bank workers, and proudly quacking as if to say, 'See, we did it! Thanks for all the help! Thankfully, one of the secretaries had a digital camera and was able to capture most of it (except the actual mid-air catching) in a series of attached photographs. 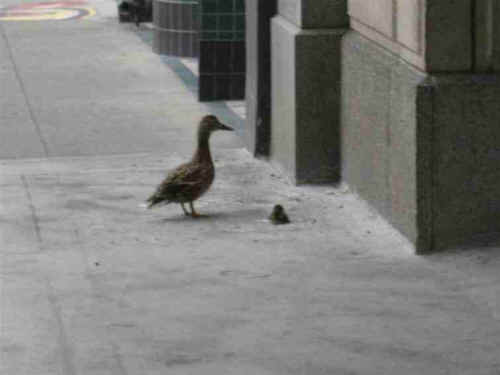 Please join me in celebrating my brother—The Downtown Duck Hero!